I got my new Pointer Brand jeans today. ( sorry the picture is out of focus ) I could have bought some jeans at the local Big Mart for about half the price of these jeans, but that is not all I am buying with this purchase. I am also buying peace of mind. The jeans from China could be made in some sweatshop with 12-year-old children as virtual slave labor under horrible adverse conditions. Then the jeans could be treated with who-knows-what chemicals to protect them from insects, rodents and mold. I don’t want those chemicals next to my bare skin! 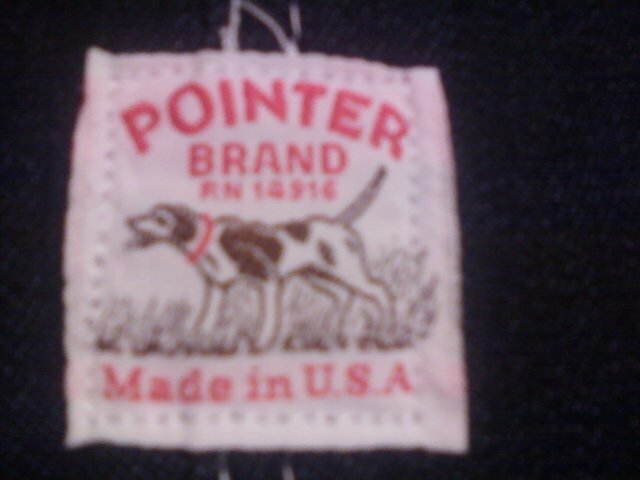 On the other hand, the Pointer Brand jeans were made near here in Bristol, Tennessee. I know they were manufactured using safe chemicals and safe working conditions under the guidance of OSHA and the EPA. That is one reason the products in the USA cost more. I also have the satisfaction of knowing I helped provide a job for someone here in Tennessee, so buy Made in the USA. 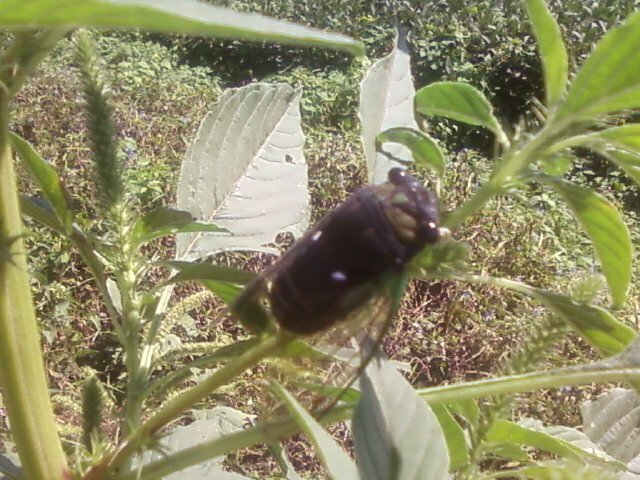 Yesterday while I was taking pictures of the wildflowers, I was lucky enough to get close to this cicada. The picture is a little blurry because he was rubbing his wings and making that distinctive whirring sound. EEEEEEHHH! Some people don’t like this sound, they say it is kind of eerie. I like it, the sound reminds me of warm summer evenings, swinging on the front porch swing. Besides, this sound helps dround out the ringing sound of my tinnitus in my ears. HAHA! If you look around you can see lots of wild flowers as you go around the countryside. 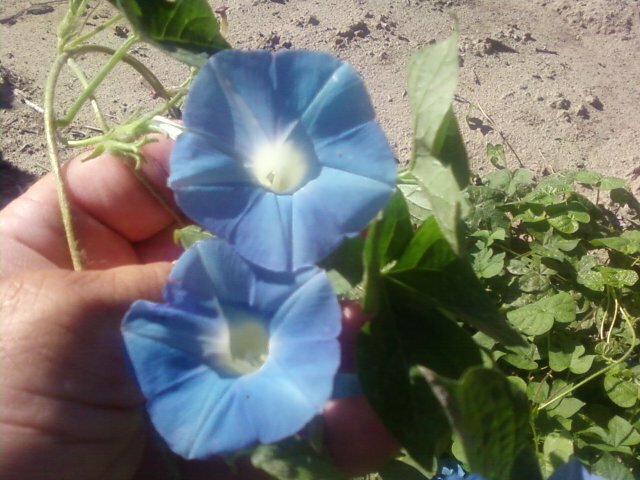 Many of these are considered weeds, but they are still pretty, like this morning-glory. 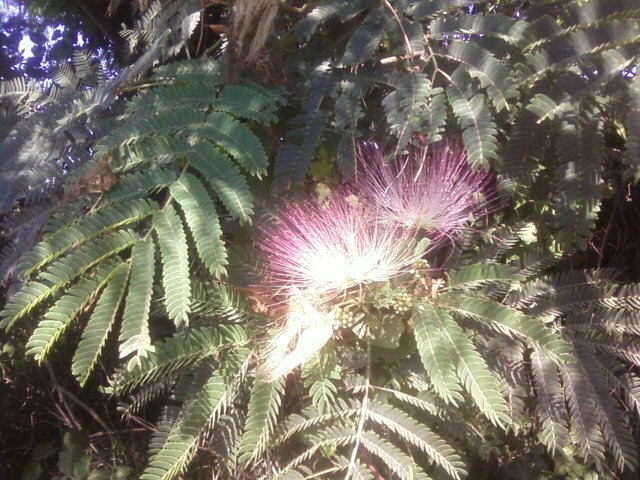 This is a Mimosa tree bloom. 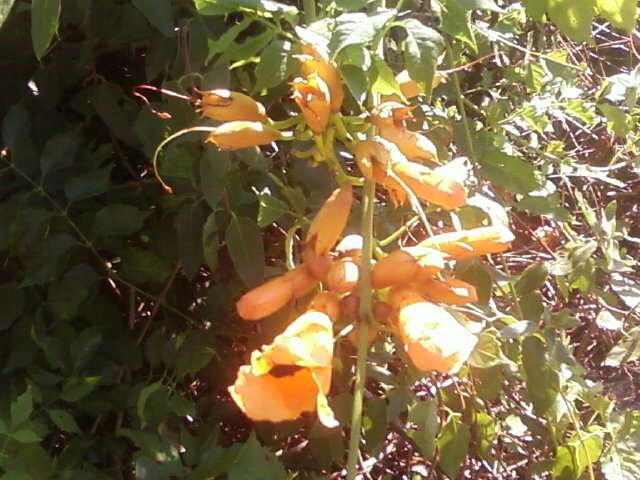 This is Golden Trumpet Creeper. 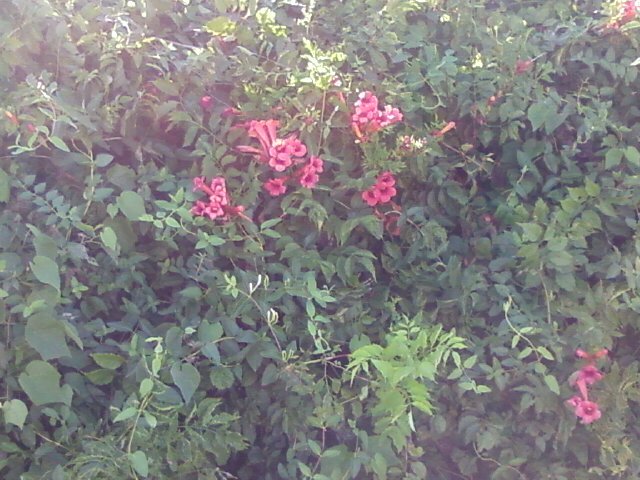 This is red Trumpet Creeper. 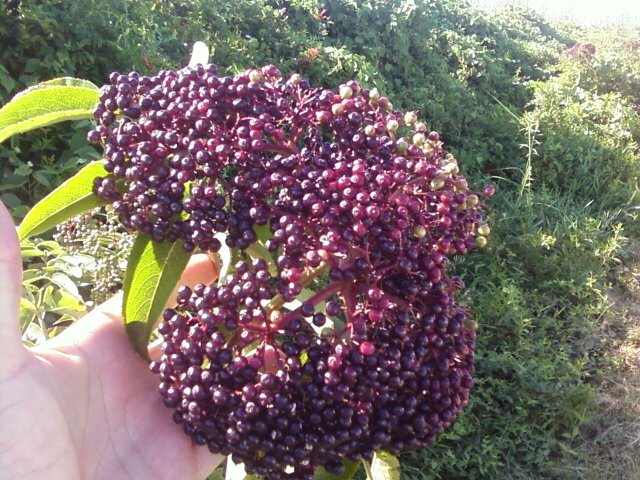 This is a roadside weed with a full head of purple berries. They look appetising, but could be highly poisonous so I won’t eat any. 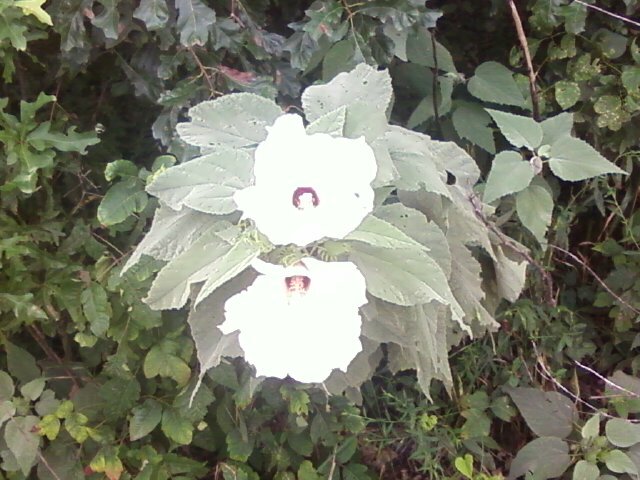 I have been watching these wild Hibiscus growing on the edge of one of the fields I check. 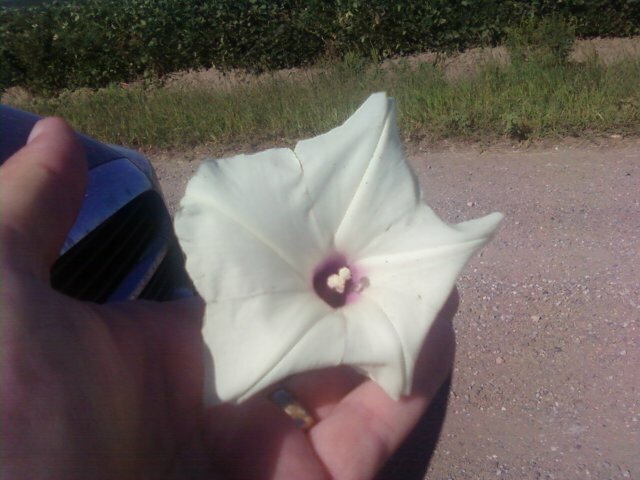 I gathered some seed pods off of them today and I will sow them around some of the ditch areas of the homestead for naturalizing. 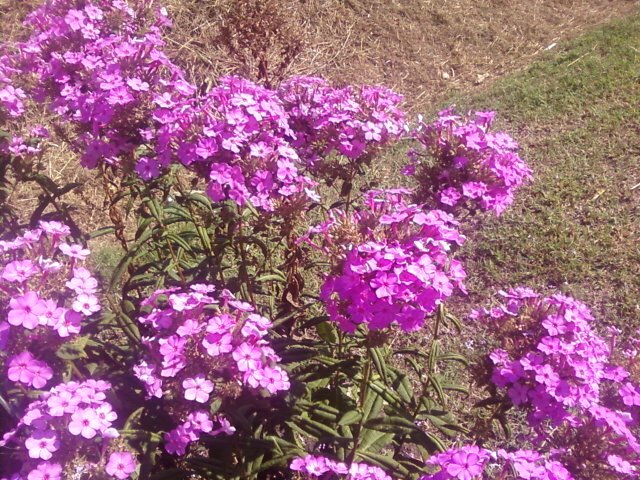 Free flowers! I recently discovered a farmer I work for started a blog this summer. The blog was actually started by his son, Woody who has gone off to medical school. Andy and his wife Karen will continue the blog in Woody’s absence. 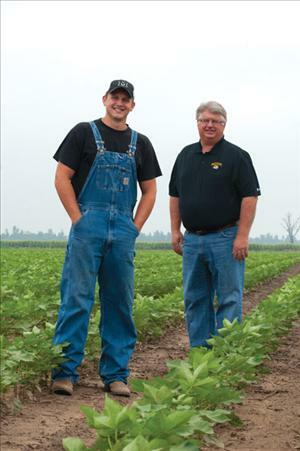 The blog details the ongoing day-to-day events on their family farm, as well as the history of their family and how they are continuing a long tradition of farming. The blog is written in an informative and entertaining manner and is well worth a look. You can go to farm-photo-of-the-day.tumblr.com or you can click on the link to the right on this page. 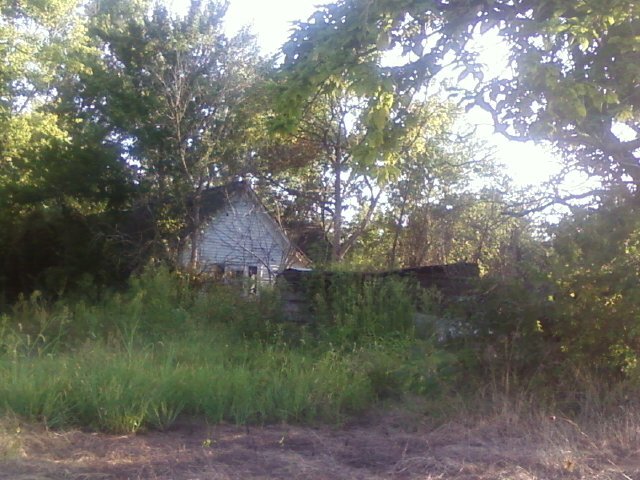 As I am going about my work, several of the farms I work have old abandoned homesteads on them. 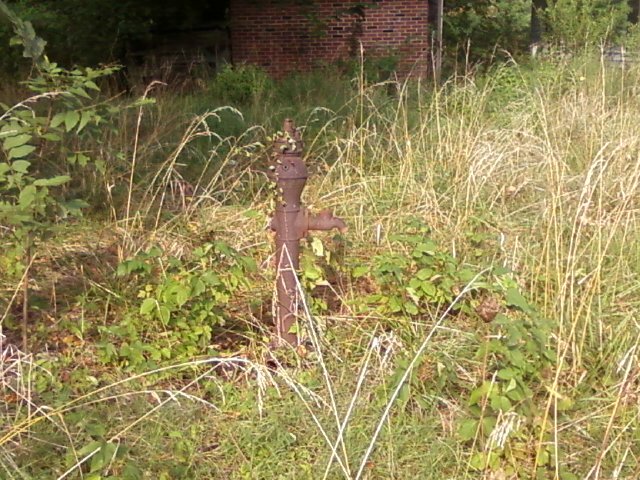 I don’t see as many of them now as I did a few years ago, they are steadily disappearing. Here are some pictures I took today. I really hate to see these old places go away, it is always the same old story. Most of these places are owned by people my age ( mid 50’s ) who have moved to town to pursue their lives. When the parents pass away, none of the children are willing to move back “way out there in the country”. Usually, they won’t sell the homestead at first for sentimental reasons, but soon the houses become unlivable due to neglect and vandalism. Then the children will finally decide to go ahead and sell. 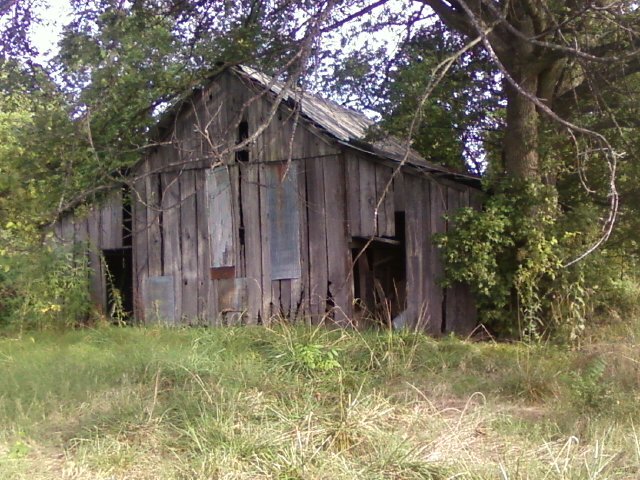 Then the first thing the new owner will do is knock down the old home and barns as well as the old trees. 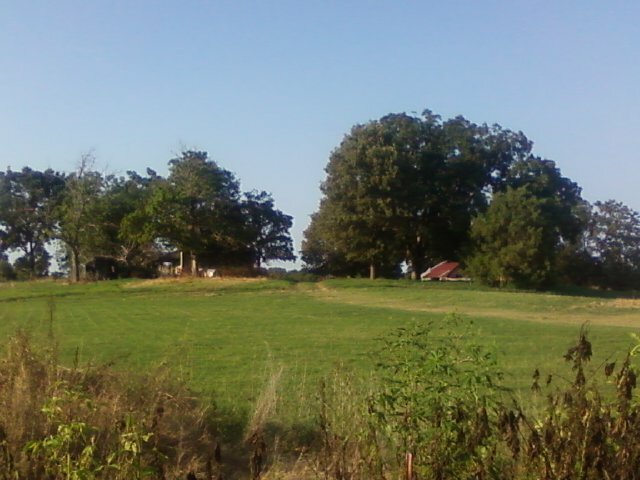 Most of these places have 100 year old oak trees , old fruit trees and pecans. The farmer won’t even try to use the trees for lumber or even firewood, they just push them into a pile and burn them. If you ever ask why, they will usually explain “son, these machines charge by the hour, I can’t afford to mess around and waste time, I need them to do what they need to do and get the job finished”. This world economy we have is really concerning me. The US owes so much debt, there is no way we can ever be free of the debt. There is no way any country could ever pay 14 trillion dollars of debt. The whole world economy is so interrelated, it is just one big house of cards. One little gust of bad luck wind and the whole thing will come tumbling down around our ears. When that happens, the depression we had back in the 1930’s will seem like a picnic in comparison. Back in those days we were a much more agrarian society and much better able to help ourselves. Even if you didn’t grow your own food or raise your own livestock, you probably had family or close friends who did. Now most of us get all of our food from the store. What happens when the shelves go bare? 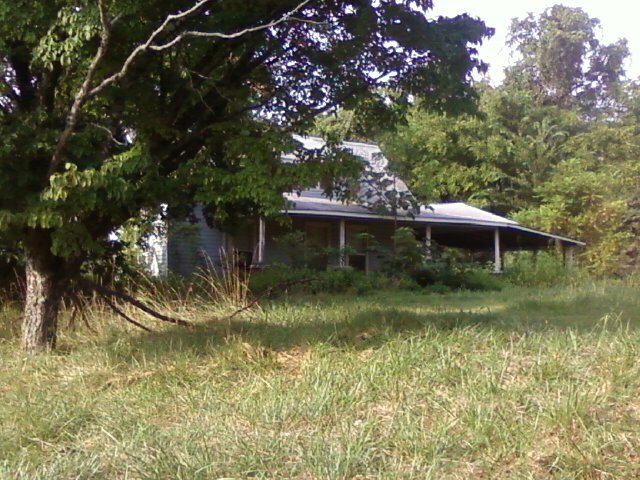 Some of these people who let the old homestead go may wish they still had them if things get really bad. Let’s pray we don’t have another depression, but if we do are you prepared? 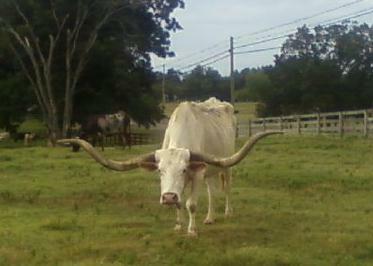 I snapped a picture of this longhorn yesterday and sent it to Sweet Thing with the message “I just bought him for our homestead”. She sent back ” Oh No! I don’t want that thing wandering around in my yard, not with those long pointed horns. You can just march back to where you got him and sell him back!” I guess she has no appreciation for the old heritage breeds. We don’t see many Longhorns around here, this man raises them to sell as a novelty. We usually raise Angus or Herefords in this area. As you can see by the picture he is sort of skinny and scrawny and probably wouldn’t make very good beef. So for all you Texas Longhorn fans who found your way to this site, all I can say is Gig Um Aggies!